Our next adventures lead us to a herb garden. 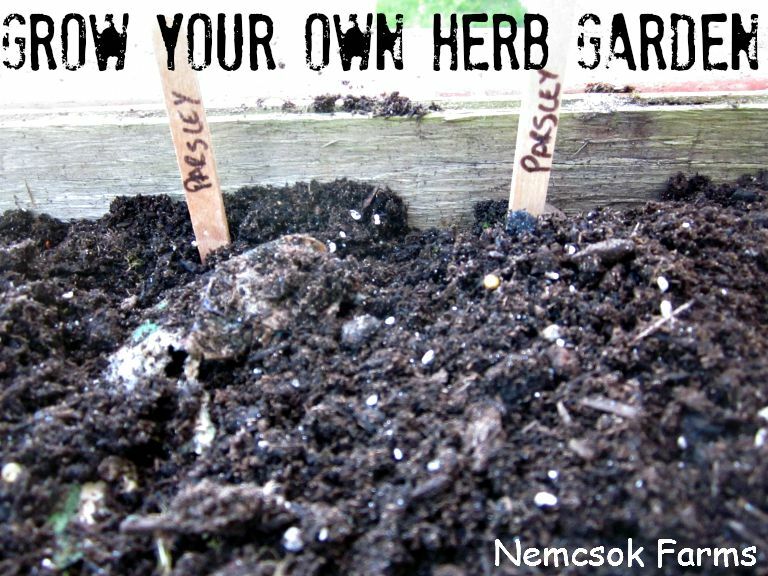 While I would love to sit here and tell you all that we always grow our own herbs, and use nothing but fresh herbs in all of our cooking… the truth is I have tried to grow my own herbs, once. I failed miserably. Growing herbs, for me, is like dusting. I have the best of intentions, and I mean well, and I am sure that if I actually just did it, I would do it well…but it is one of those things I never put much energy into. The one time I grew herbs, it was a neat little kit that someone got me for a Christmas gift, and it sat on a shelf for the better part of two years, until I found myself living on a farm, and I thought, Hey! I am a farmer now, I will grow herbs! I will have a herb garden. Well, I planted the seeds, tended to them ‘til there were plenty of wonderful little sprouts, and then put the clay pot on a pretty little hook by a window…and much like the dusting, out of sight, out of mind. I have however in the past found myself wishing I had plenty of fresh dill at my disposal. I mean, who wouldn’t? Dill is fabulous! ( Especially when it comes time to pickle all those tasty cucumbers!) And mint! Yum! As for most other things, I don’t use a whole lot of spices / herbs when cooking, and usually dried stuff from the grocery store has served me well. Yet, I have the space, and the seeds. Why not give it a whirl again? I am a farmer, I will grow herbs! I will have a herb garden. So today two of my little helpers and I cleaned out some planter boxes, and planted parsley, chives, oregano, basil, thyme, and tarragon. Anybody have any suggestions, helpful hints, or pointers that I should know when caring for a herb garden? I plan on planting some mint somewhere else. Not in the boxes, but perhaps as a border somewhere, or in a raised bed all on its own. I would like to surround something with mint, as I hear it keeps the mice away. I also hear it can really take over. I refrained from planting anise. I have a couple of huge licorice lovers here, but I hear the mice just love the stuff, and I am not a lover of mice. I did not plant dill, only because I didn’t have any seeds. If this herb garden works out for me, I will be sure to add dill in the future. I will also tell you all about it. Please share your own herb garden with us in the comments below, we love to hear from you. See all of our other Gardening Posts (click on the link) and sign up for our newsletter!